“The first time I made a photograph of a moonlit landscape, I literally said “wow” out loud. 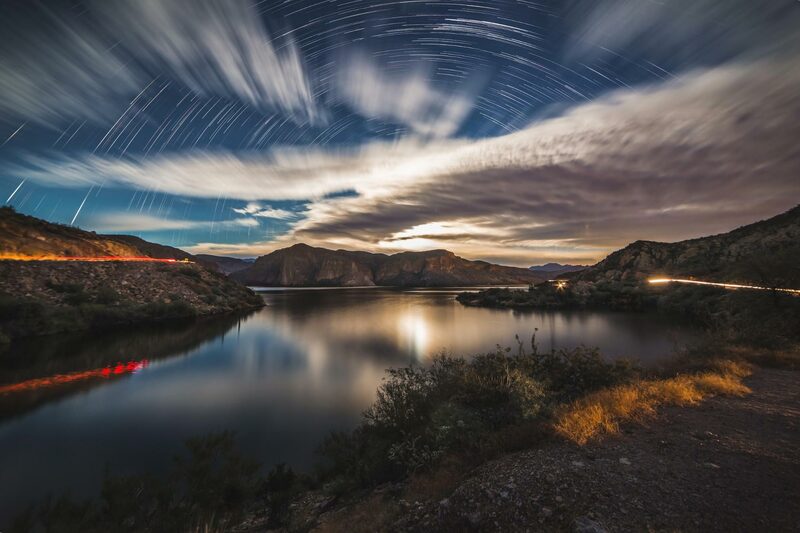 I couldn’t believe how much detail the moonlight brought out of the photograph.” In this tutorial, Tyler Sichelski walks through his process for shooting and processing surreal long exposure landscapes under the light of the Moon. Landscape photography is all about chasing the perfect light. Most of us know of this time as “magic hour”; usually 1 hour after sunrise and 1 hour before sunset when the sun is low above the horizon, but sometimes we forget about the other light source in our sky: the Moon. Photographing under the light of the Moon can create dramatic, surreal landscapes that will set your photography apart from the rest. The full Moon’s surface reflects an average of 12 percent of the sunlight that hits it. The soft moonlight is unlike the harsh daylight and interacts with the landscape in a different way. The first time I made a photograph of a moonlit landscape, I literally said “wow” out loud. I couldn’t believe how much detail the moonlight brought out of the photograph. 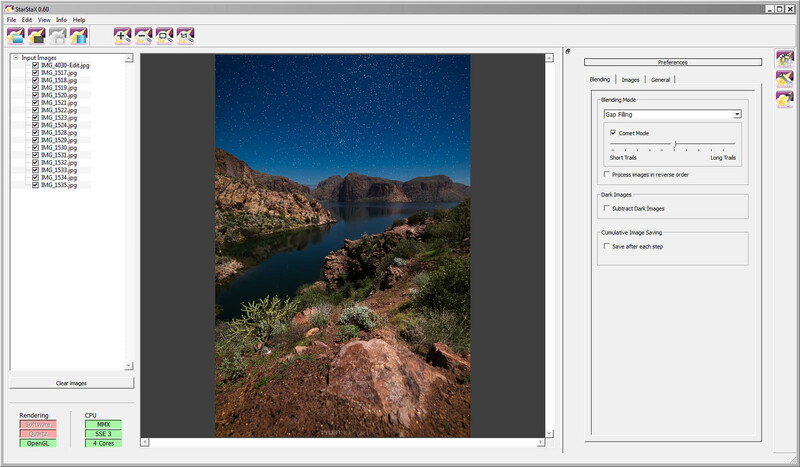 In this article I will walk you through the process as I prepare for a moonlit landscape photoshoot, teach you how to capture some amazing shots, and show you how to stack multiple exposures to create an impressive final image. The best part: you can achieve incredible results with entry level equipment. The first time I made a photograph of a moonlit landscape, I literally said “wow” out loud. I couldn’t believe how much detail the moonlight brought out of the photograph. You do not need an expensive camera to capture amazing images under the Moon! Any digital camera with manual controls will work. Manual controls give you full control of your camera’s aperture, shutter speed & ISO. 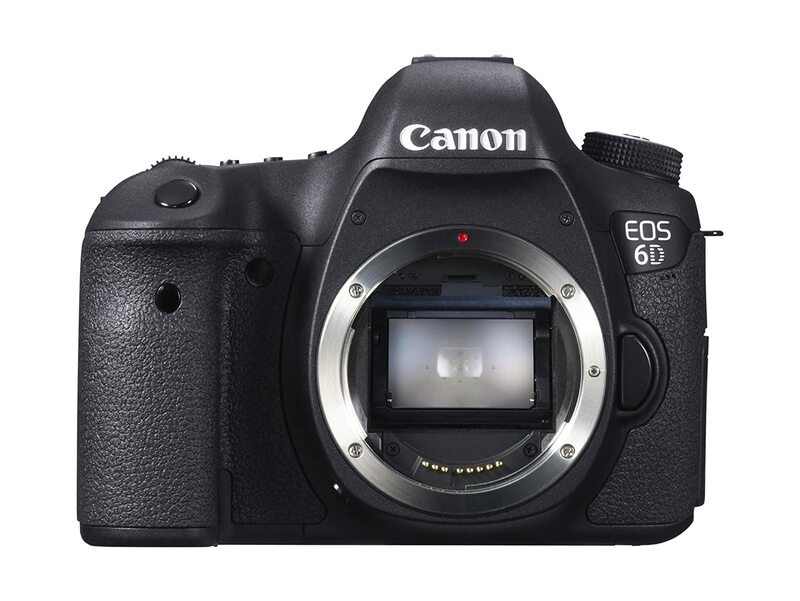 For this shot I will use my Canon EOS 6D. 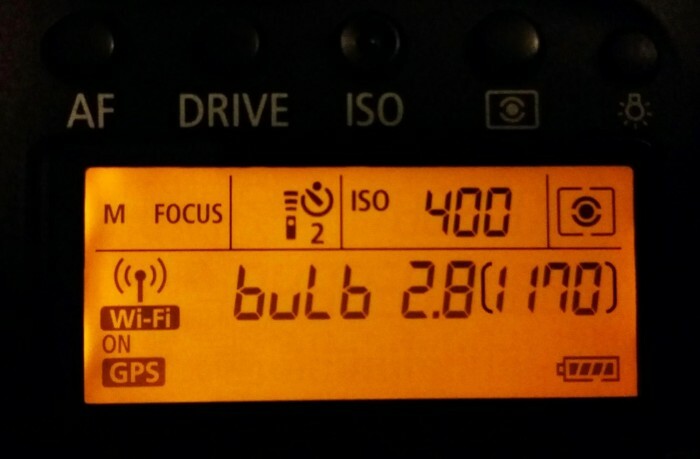 Bulb Mode functionality is ideal, but is not absolutely required. Bulb (indicated as B on your camera), is a shutter speed setting that allows for long exposure times directly controlled by you. Simply put, the shutter will stay open as long as you have the shutter release button pressed. I highly recommend a lockable shutter release cable or an intervalometer to prevent any vibrations that may blur the final image. On my Canon 6D and many other cameras, a shutter release cable is necessary for exposures over 30 seconds. 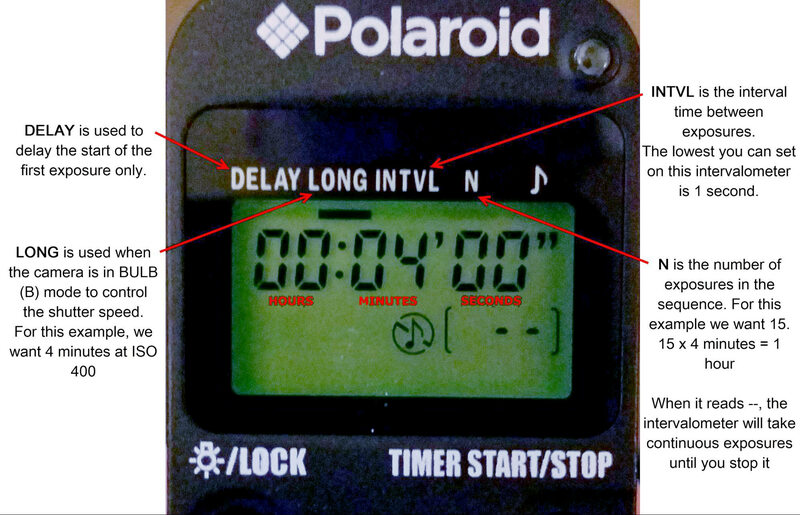 For this tutorial, I will be using my cheap Polaroid Intervalometer. I’ll use either the shutter release lock for exposures over 30 seconds or program the interval timer to a specific shutter length. There are a lot of affordable third party intervalometers available. Just make sure you find one that’s compatible with your camera. Lenses with a large aperture (low f/number, i.e. f/1.4) are often called “fast” lenses. A lens’s f/number represents its largest possible aperture. The lower the f/number the more light it lets into the camera. I prefer low f/number lenses because they tend to be sharper when *stopped down. For moonlit landscapes, I would recommend using a lens with an f/number of f/4 or lower. Almost any wide angle lens will fit into this category, and that includes the 18-55mm kit lens that most likely came with your DSLR! *In theory, when using an f/4 lens, you should be able to increase the sharpness of your image by “stopping down” to f/5.6 (as we will in our example) instead of “shooting wide open” at f/4. Focal length will depend greatly on where and what you are shooting. Shorter focal lengths are great when capturing large scenes, and a long telephoto focal length is great for isolating specific areas in the scenery. Be aware of zoom lenses with a variable aperture like an 18-55mm f/3.5-5.6. The lowest aperture f/number varies from f/3.5 to f/5.6; this means that as you increase the focal length, the f/number will get larger. With lenses like this, it tends to be best to zoom out to its shortest focal length to give you access to the lowest f/number for night photography. 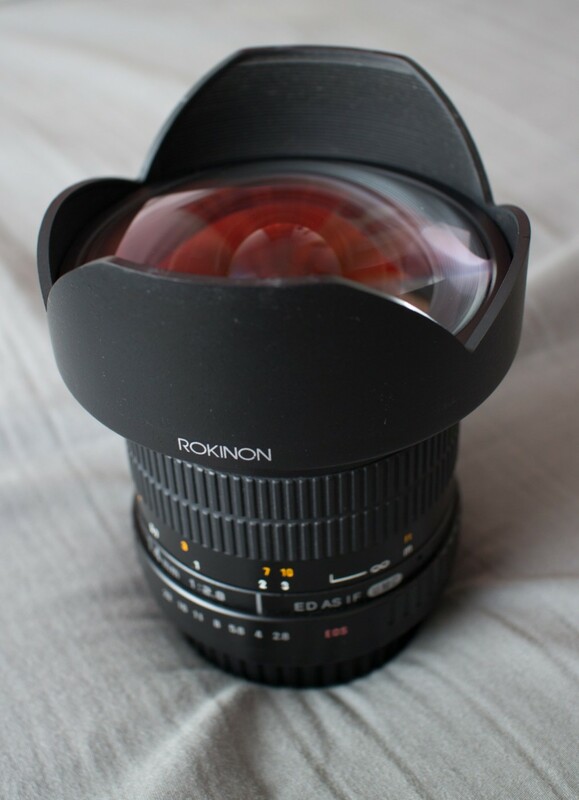 I will be shooting with my Rokinon 14mm f/2.8 lens for this tutorial. It’s a fully manual lens and is very sharp when shooting at f/4. It’s available for most camera mounts and is arguably the best 14mm glass you can buy for the price (less than $400, compared to the Canon 14mm f/2.8L which is well over $2,000). However, on a full-frame camera like my Canon 6D, there is noticeable moustache distortion, most of which can be cleaned up using profile corrections in Adobe Lightroom or the RAW editor of your choice. One of the most important pieces of your kit will be your tripod. During very long exposures, it is vital to have your camera rock solid. You don’t want to be sitting around for minutes and have a slight breeze ruin your shot. 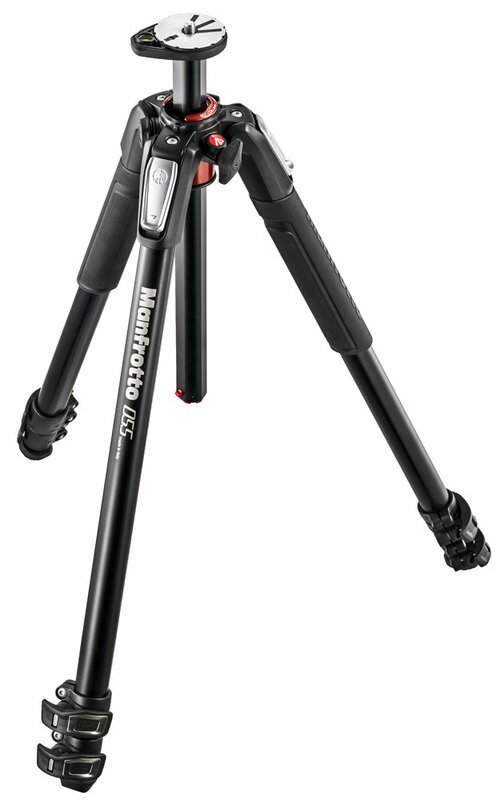 There are a lot of brands out there; I personally use the Manfrotto MT190XPRO3 tripod with a Manfrotto 498RC2 ball head. 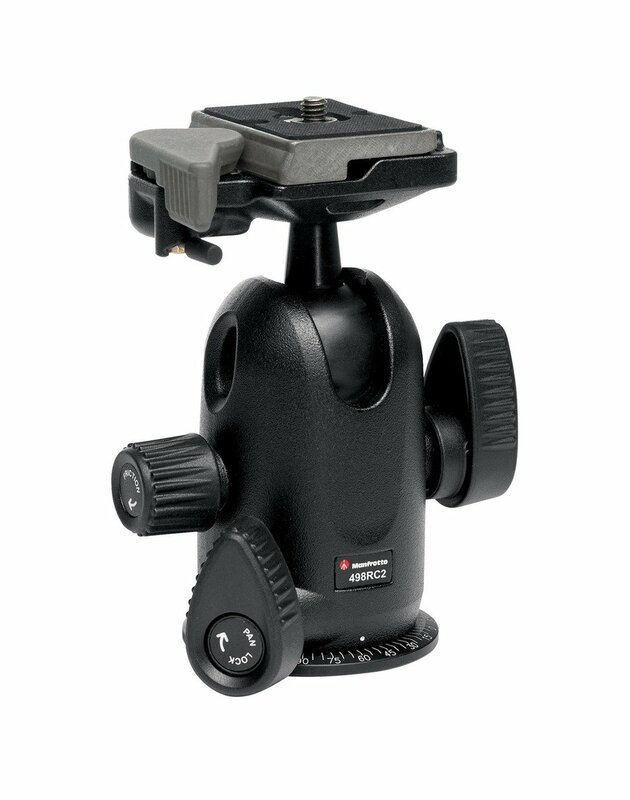 I love using ball heads because it allows me to move my camera freely in all directions with one turn of a knob. 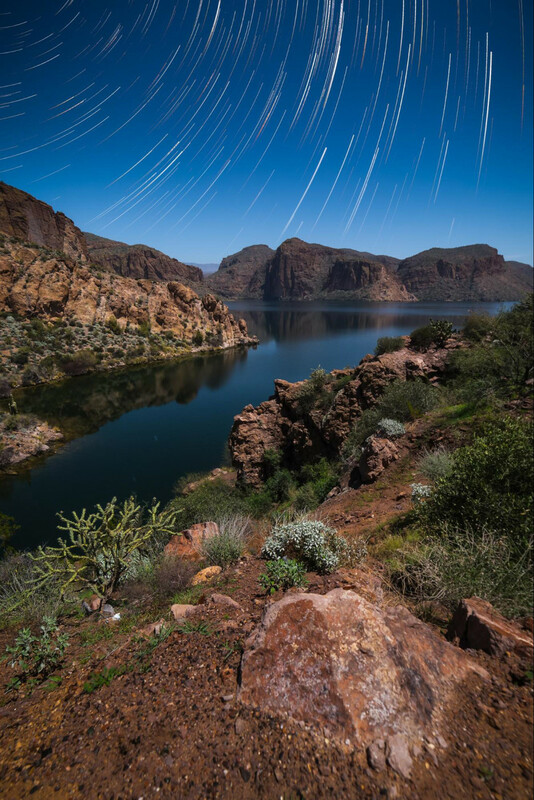 After our shoots, we’ll use Adobe Photoshop or StarStax to combine multiple exposures into one final image. See Post Processing section below for details. I like to use www.timeanddate.com for a general forecast of when the Moon will be within +/- 3 days of a full Moon and where it will be in the sky on those 7 nights. Also note the altitude the Moon will be at and at what times. 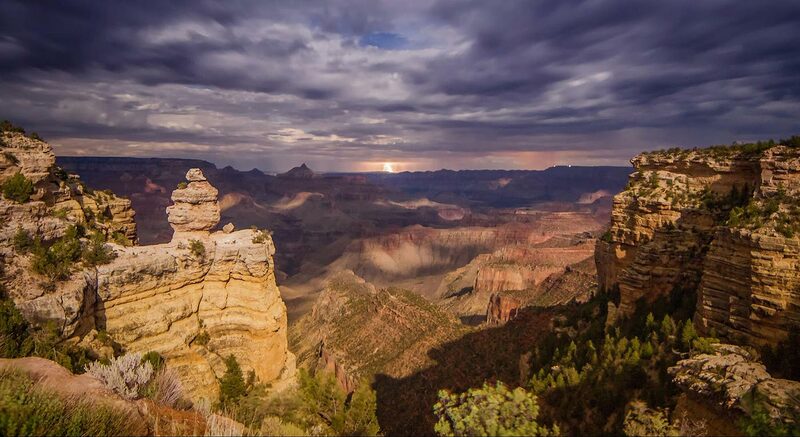 The most dramatic moonlit landscape photos come between 30 – 70 degrees, after astronomical twilight. The most dramatic moonlit landscape photos come between 30 – 70 degrees, after astronomical twilight. The lower the altitude of the Moon, the more dramatic the shadows on the landscape. For a more precise Moon forecast and to predict the exact direction of the moonrise and moonset, I use the Photographer’s Ephemeris. The desktop version is free to use, and they also have paid Apple/Android apps that you can take in the field, which is very handy. Another photography planning app with Moon information that I highly recommend is PhotoPills for iOS. 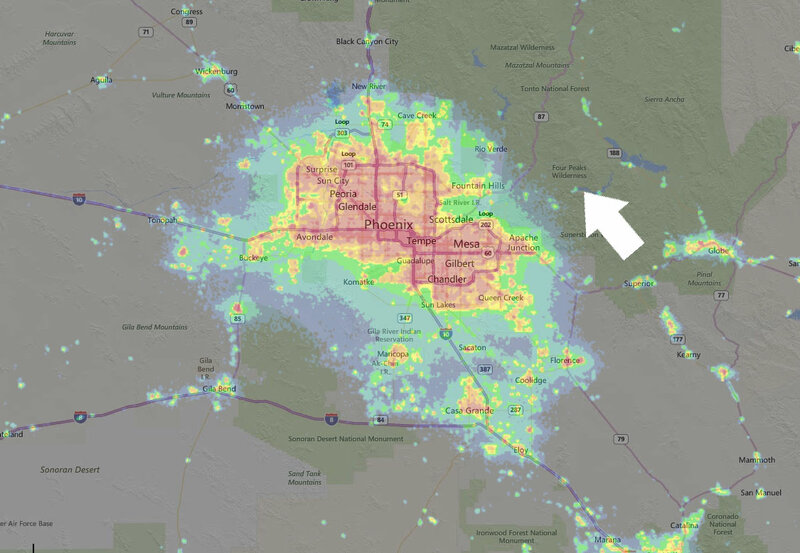 For the best results, I recommend finding a dark location away from the light pollution of major cities. I use lightpollutionmap.info; it has worldwide coverage, and I’ve found it to be very accurate. 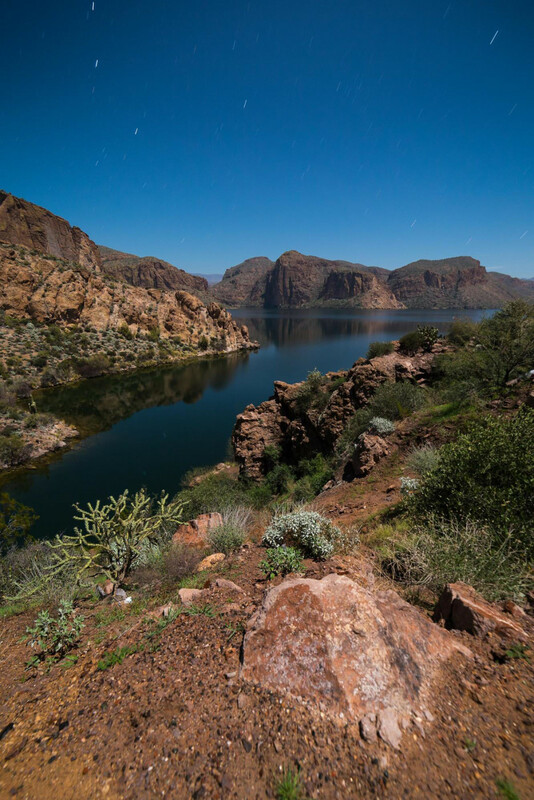 Tonight I will be shooting at Canyon Lake in the Superstition Mountains outside of Phoenix, Arizona — one of my favorite places to shoot. I also use Google Earth to scout an area that I’m unfamiliar with. I recommend starting your search at national and state parks in your area, as these often have gorgeous landscapes away from all the city lights. I try to arrive on location while there is still light, especially if it’s my first time visiting. This will help you familiarize yourself with the location and allow you to start thinking about the composition of your photo. I recommend setting up your camera and taking a few shots while you are close to your car. Once your eyes’ night vision takes over and you become more confident, you can explore more of the area. Wind will blur trees, bushes, flowers, etc. ; keep this in mind if you’re shooting on a windy night. When planning your shot, keep in mind that long exposures will make calm water look like glass, and choppy water like a ghostly fog. It will also turn clouds silky smooth, moving in the direction of the wind. Wind will also blur trees, bushes, flowers, etc. ; keep this in mind if you’re shooting on a windy night. There are many articles discussing the benefits of shooting RAW over JPEG, so I’ll keep it simple: Shoot RAW! When shooting JPEG, image information is compressed and lost. No image information is compressed with RAW so you’re able to get higher quality images as well as correct issues with white balance or exposure in post processing. I will be setting a custom white balance of 4100 degrees Kelvin. I find this to look the best with moonlit images. White balance is greatly based on your personal taste, but start somewhere between 3800 – 4300 degrees Kelvin. If you are shooting RAW, you can also change white balance in post processing. When shooting any kind of long exposure images, I always turn the Long Exposure/High ISO Noise Reduction to OFF. If turned on, the camera will take a frame of equal exposure and apply it to your image to reduce noise caused by the sensor. For example, if you take a 10-minute exposure, then you will have to wait an additional 10 minutes before being able to take another photo. I personally like to reduce noise in post using the Google Nik Software. The Exposure Triangle is very important to remember, as a change in one of the elements will affect how we use the other two. I will briefly discuss the three, and show examples of different exposures. As was discussed earlier, I recommend a relatively low f/number for these shots. This doesn’t mean you can’t capture images with slower apertures like f/5.6. Just keep in mind that for every full aperture stop, you are cutting the amount of light in half. If your lens collects less light, it means we must compensate with either a higher ISO or longer shutter speed to maintain the same exposure, which might not be as desirable as just shooting with a lower f/number. For our example shot with my 14mm f/2.8 lens, I’ll be stopping down to about f/4 to f/5.6. That’s the setting I would recommend if you’re just starting out. 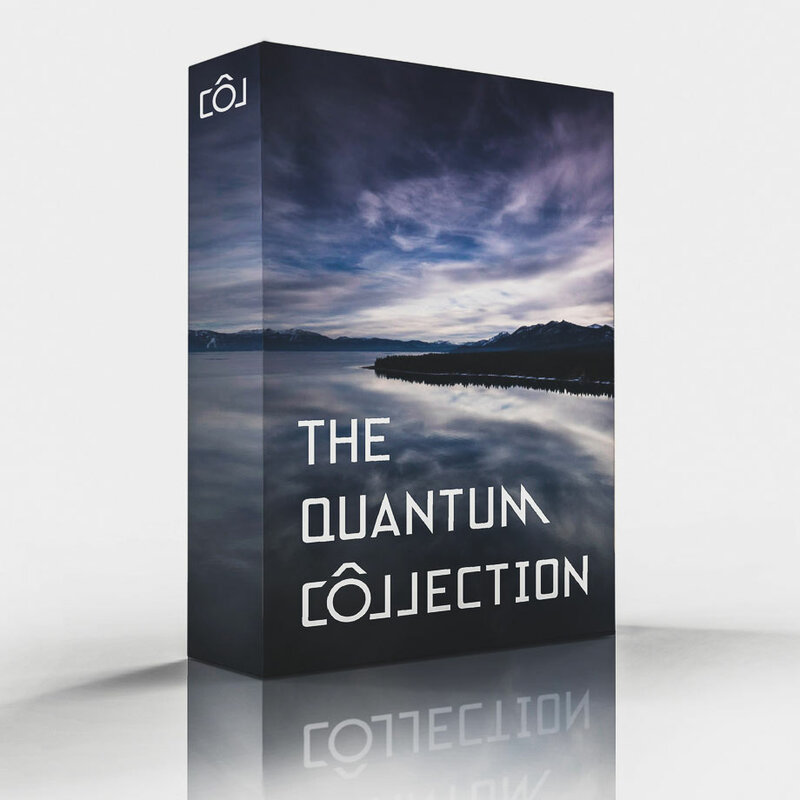 ISO can simply be understood as the the amplification applied to your camera’s sensor. Higher ISOs yield a brighter image but also brighten up the noise in the image. That being said, don’t hesitate to bump that ISO up if needed. We will want an ISO around 400-800 for this shoot. ISO 100 might seem tempting, but this will require VERY long exposures of 45 minutes or longer. Long exposures like this introduce their own noise, rendering the low ISO pointless. Keep it around ISO 400-800 to start. The final and most important part of the exposure triangle (for long exposures, at least) is shutter speed. Your final result will vary greatly depending on your shutter speed. I personally love the still water and cloud movement from a shutter speed of about 5 minutes or more. To make these extra long exposures, we’ll need to set the camera to “Bulb” mode to be able to shoot exposures longer than 30 seconds. Setting a camera to bulb mode allows for exposures as long as the shutter is pressed. Just remember that there’s also a disadvantage to using too long of a shutter speed: Very long shutter speeds beyond 10 minutes will start to introduce extra noise, depending on your equipment. The first thing I do before composing a shot or adjusting my exposure is making sure the lens is focused. Since we will be on a tripod, switch your lens or camera to manual focus, and turn your image stabilization function (IS, VR, OSS) off. Stabilization can actually do more harm than good while on a tripod, so it’s best to just turn it off completely. Generally speaking, you will want to be focused to infinity for most shots. Most lenses have an ‘∞’ symbol to indicate when the focus is at infinity. That said, the infinity marker can often be a little inaccurate, so use it with skepticism. The easiest and most accurate way to focus in the dark is to manually focus on a distant light (min. 100ft/30m away) while in Live View mode. With my camera, I can change my live view setting to “exposure simulation” which allows me to see the light source (even a bright star) in dark conditions. I have also used a laser mounted to my hot shoe with some Blu-Tack and pointed at a distant object and focused on the laser dot. You can also place a flashlight at that distance and focus on that to achieve the same result. If you’re having difficulty, take some test shots and check your focus, making small adjustments as needed. At this point I like to take a test shot by bumping my ISO to its max (H2 – 25,600) and shooting a short 2-second exposure to see what my composition and focus looks like. I like to include some interesting foreground elements and leading lines and put my horizon on either the top/bottom ⅓ of the frame (Rule of Thirds). Once I am happy with the composition, I put my ISO back to 400 for the final shot. So now that I have you thinking about the exposure triangle and scrutinizing your focus, it’s time to take a shot! After the exposure is complete, it’s helpful to look at the histogram. You want to have as much data as possible without losing any data at the edges. You may need to experiment with different exposure times to get the histogram to sit roughly centered. Below are 5 unedited images of different exposures times at ISO 400, f/5.6. In my experience, I’ve found ISO 400 and an aperture of f/4 – f/5.6 provides me the best long exposure time/noise ratio under a full Moon. The arrows indicate the amount of cloud movement I typically notice in the southwestern U.S. (relevant only on a night with clouds). In this case, the 4-minute exposure should give us the best balance between individual exposure time and image quality. In the next section, we’ll program the intervalometer to continuously capture a series of consecutive 4-minute frames for a period of about 30 minutes to an hour. This will result in approximately 7 – 15 total exposures. Now, in order to get more interesting results for our final image, we’ll use a technique of stacking those exposures to make a final multi-exposure composite. Once we’ve captured about 30 minutes to an hour of photos, we should have plenty of data to make our final exposure stack. In the next section I’ll talk about a couple of methods for stacking all the exposures together into a final image. In Photoshop choose: File > Scripts > Load Files into Stack… and select all your moonlit images. 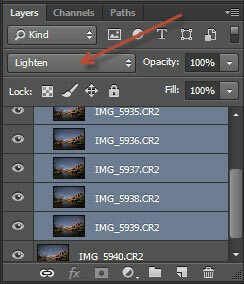 Once loaded in Photoshop, highlight all layers except the bottom layer and change the blending mode to Lighten. That’s it. Now you can flatten the image (Layer > Flatten Image) and Save. There is also a great program made by Markus Enzweiler called StarStax which will effectively do the same thing as Photoshop. StarStax is a very powerful yet simple way to stack exposures. Its purpose-built for star trails, and it has some features that aren’t available in Photoshop. The best part about this program is that it is entirely free, opening up this type photography to everyone. The major benefit of using StarStax is a Blending Mode called “Gap Filling” which will fill in gaps in the star trails that we missed during the 1 second interval between exposures. There is also an option under Blending Mode called “Comet Mode” which will fade your stars slightly with each exposure, giving the illusion of movement to your star trails. Note that this “Comet Mode” is more effective when shooting with shorter shutter speeds like 30 seconds. That’s about it! Remember: it doesn’t require the best equipment to have some fun and get spectacular nighttime photos. So explore, get creative, have fun and most importantly, stay safe! Try it out and share what you create! Post and share your moonlit shot on Facebook, or post to Instagram or Twitter with the hashtag #tpc_moonlit. 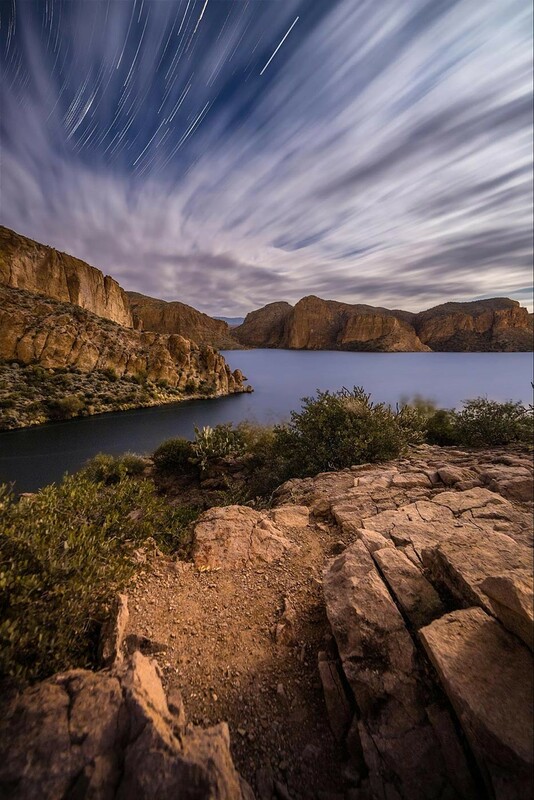 Tyler Sichelski is a photographer based in Arizona.Tyler loves to specialize in landscape, astro and long exposure photography. He is very passionate about photography and teaching others. Check out his portfolio and workshops at his website: tyskiphoto.com and follow him from his Facebook, Instagram or Twitter. Thanks for the detailed article on low-light tips and moonlighting landscapes. 🙂 Will be sure to pass along. The upcoming blue moon and recent solar eclipse are stellar opportunities to document rare phenomena in the heavens. Enjoy! I am a night photography freak and your article as well as the pictures are amazing. There is a unknown world for photographers after the sunset. Thanks for sharing your knowledge and time. This post is so amazing! it giv me hope that something this awesome is possible. i am rather sadden after realizing that i will be facing a full moon situation in bromo on my travel date and this post and techniques allow me to try out something which would possibly yield great results. thank you. I had amazing opportunity to go to US this month, and while I was shooting stars in Arches, Utah, beautiful full moon was rising just between the spectacular rock formations. The thing is, I completely failed shooting it and the foreground on the picture with it – either the moon was a gigantic overexposed bowl of light, either there was nothing else visible besides the moon… Do you consider making a tutorial/article about shooting the landscape with the full moon itself? Thank you very much, Sergio! I did everything and found one problem….blue and red little flecks throughout the image, aside from the regular noise. A quick google search finds that its due to sensor building up heat and having “hot pixels”. How do you get around this problem? Im using a Sony A7II. F5.6, 5 min exposure, ISO 400. Hot pixels are an unfortunate side effect due to the overheating of the camera sensor during long exposures. The unattractive fix is to turn on long exposure noise reduction within the camera, which may help the camera remove these pre-post. This will keep you from taking a photo equal to the length of your exposure. or, you can try to remap your sensor using the sensor cleaning in the camera menu. I did this recently and it removed most of the hot pixels in my camera. Run the sensor cleaning, then turn the camera to bulb mode and hold down the shutter for a minute or so, then run the sensor cleaning again. The camera should catch them during the remapping while the sensor is still hot. Thank you so much for the feedback Phyllis! Hi guys. Great article btw. Thanks for posting. Tons of useful info. Just an extra little point to note. Stopping down to f/4.0 or f/5.6 will sharpen up your star trails as well. But that’s not the reason for my message. Lets say you also want to go out and shoot outside of those seven nights around the full moon. Therefore the moon will not be as bright as there is less surface area reflecting the sun’s light. What would you alter in the way of settings to compensate for this? Personally, I would be reluctant to start increasing my ISO too much or opening the aperture more. Perhaps just increase your exposure time? Hey Jonathan! Thanks for the feedback. Generally speaking, if I were outside of those 7 days, I would increase the exposure time before ISO. That being said… The 6D handles noise very well, so i have no problems bumping the ISO in situations where exposure times are passing 10 minutes.